Away fans are housed in the William Sharp Stand, an all seated stand behind the goal which holds just under 2,000. The ground is a small ground (9500 capacity) with stanchions giving a restricted view all around the ground. There are corporate facilities available for away fans contact the club Secretary for further details. Plans are in operation to convert the home end to all seater via a new two tier cantilever stand ? work has not started nor at the time of writing has any date been stated for commencement. 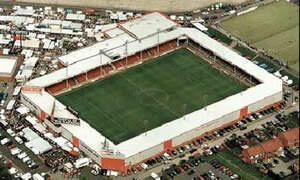 For season 2002-2003, Mel says 'work has commenced on Bescot Stadium in replacing the 'home' Gilbert Allsopp stand with a new Cantilevered construction so the home fans will be housed in what was the away end (William Sharpe Stand). The visiting supporters will be housed in the Banks 's family stand but will be limited to around 600 visitors'. Exit M6 Junction 9 Take the Ring Road - Broadway West (A4148) passing Morrisons on your left through their traffic lights over the bridge taking the right hand lane turning right into Bescot Crescent, pass Broadway Retail Park the ground is a mile down on the left. The away car park is second left adjacent to the away end the William Sharpe stand. Head in Via the Ring Road Broadway North / Broadway (A4148) Turning left at the New Fullbrook public house onto the West Bromwich Road (A4031) take first right into Walstead Road west which leads into Bescot Crescent, the away car park is the first car park on the right. Bescot Station is directly opposite the Ground with regular trains to and from New Street Station - Birmingham. There is car parking for away fans at the Ground, and at the Rail station opposite and free parking at Broadway Retail Park. It should be noted though that these car parks do take a long time to clear, sometimes in excess of an hour. Adjacent to the ground, does allow away fans entrance but does get full early. A large pub opposite Morrisons supermarket often favoured by away fans. At the intersection of West Bromwich Road (A4031) Benches and tables outside, favoured by home fans. Lord Street - pass the traffic lights to the ground turn left into Lord Street pub 50 Metres on Right - Noted for its real ale. Firkins Bread shop do Sandwiches and ?Hot & cold? snacks. If you are a registered user then you can login, and create your own personal review of Walsall Football Club - Bescot Stadium. These reviews can be private or public.